The Capture of Tobruk June 1942 - Hoping to avoid a repeat of Operation Crusader, Rommel relentlessly pushes his Afrika Korps after smashing through the British lines at Gazala. Can you help him capture Fortress Tobruk? This Battle Map set also includes 4 Standard scenarios: Raid on Barce and Rommel's Right Hook, featuring the new jeeps as long-range patrol cars; Panzers in the Atlas and Le-Mesnil-Adelee, featuring the new Sd.Kfz. 250 half-tracks; and detailed rules for the long-range patrol cars and half-tracks. This is not a stand-alone game. Requires one copy of Memoir '44 and the Operation Overlord expansion, or two full copies of Memoir '44. 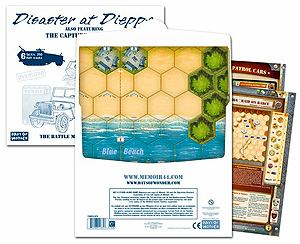 The four Standard scenarios require the Terrain Pack and/or the Mediterranean Theater. Purists wishing to use all figures of the proper colour in Overlord scenarios will need two copies of the Mediterranean Theater expansion.